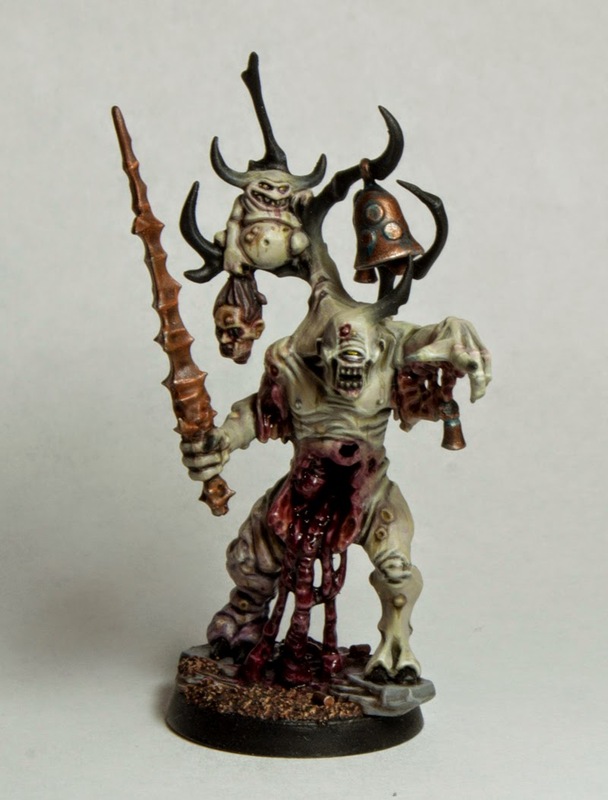 I realized awhile ago that I have never posted a complete set of pictures of my Golden Demon winning Plaguebearer squad so while I was taking pictures of Angron for last week I decided to snap some of these guys as well. I entered them into the US Golden Demons last year and these bad boys took home a silver trophy in the 40K Squad category which I was very happy about. This is the first unit display stand that I have ever made and it turned out a lot better then I though it would. 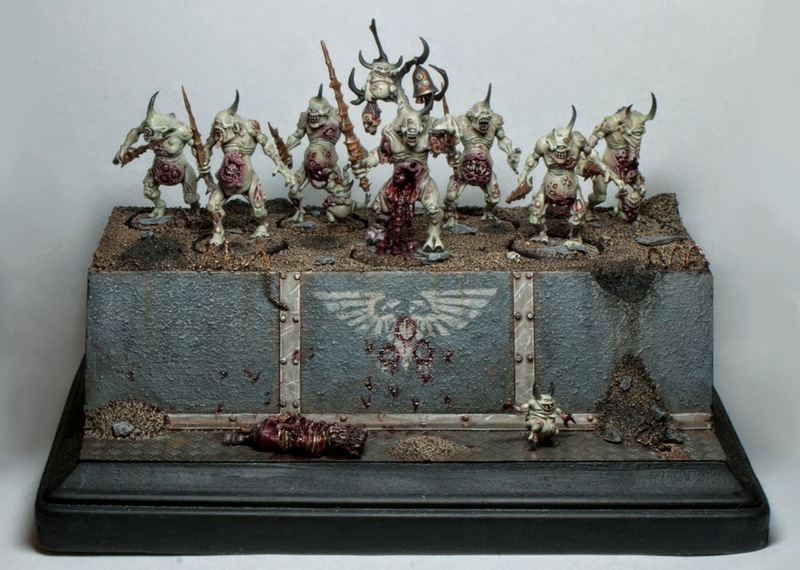 I knew I wanted a trench since I feel like that's very 40K and there is a piece of artwork from the Demon codex showing some Plaguebearers assaulting an Imperial trench that I think is awesome. 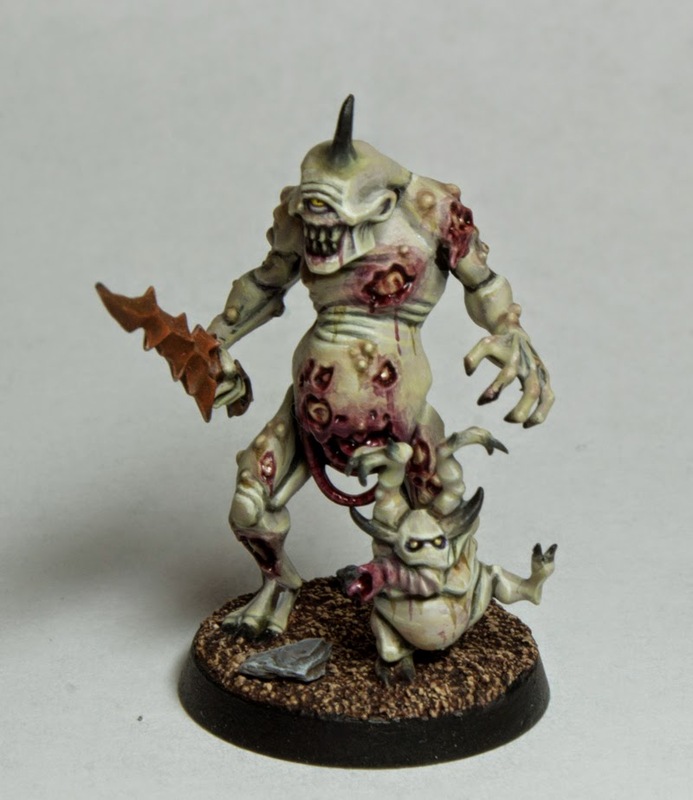 This was the first mini I painted for the unit. When I staerted on it I had no intention of entering them into a competition, they were just going to be a gaming unit. 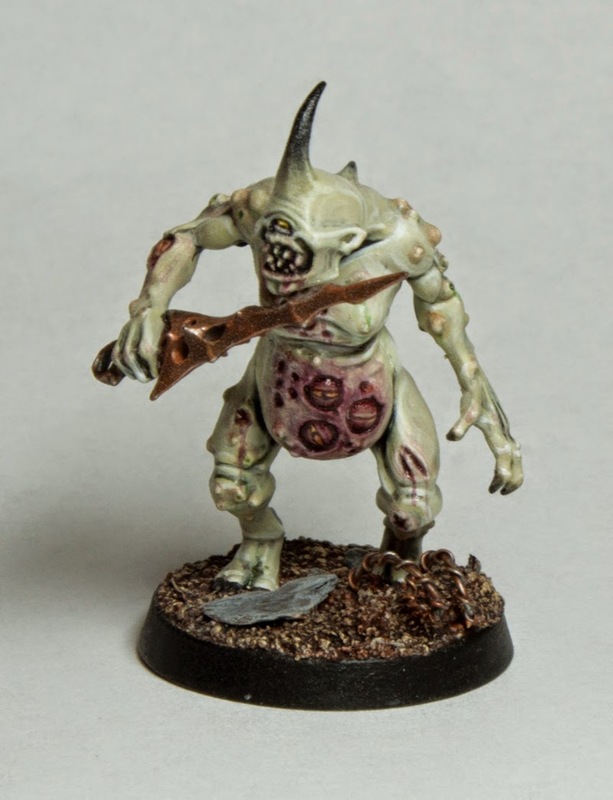 I got them back when the new Plaguebearers first came out in the summer of 2012. I really liked the new sculpts and wanted to try and update my color scheme. I already had 30+ of the old metal ones all painted up but I had worked on them mostly during 2009 and my skills and standards had improved a lot since then. Each of them took me about 10 hours to paint I would guess. The longest part is of course the skin and once I got over that hurdle it all went much quicker. I painted them one at a time since they were so time consuming and in the end that worked in my favor since it produced a Golden Demon worthy unit. I painted these first 3 over about 3 months and then they were left to sit for a couple of months with no work done on them. Sometime in the spring I started to seriously think about what I was going to enter into the competition that year and took a look around my painting desk. 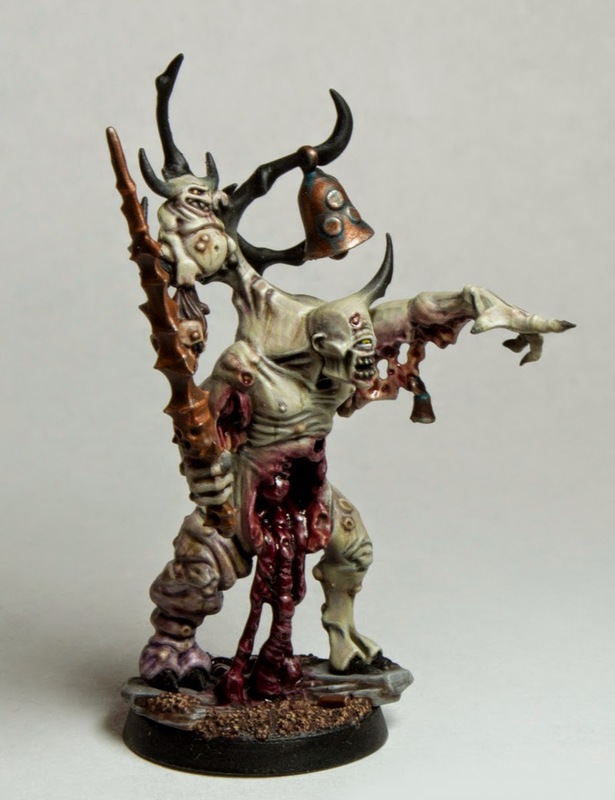 I usually have at least one very serious new entry that I devote months to painting (my chaos lord last year), 1 or 2 other slightly less serious new entries and then I look at the stuff I have already painted that year and pick the best. These guys kind of fell in the middle since they were half done at the time. Over the next 5 or so months I slowly painted the remaining members in between other projects since I didn't want to rush and ruin them. 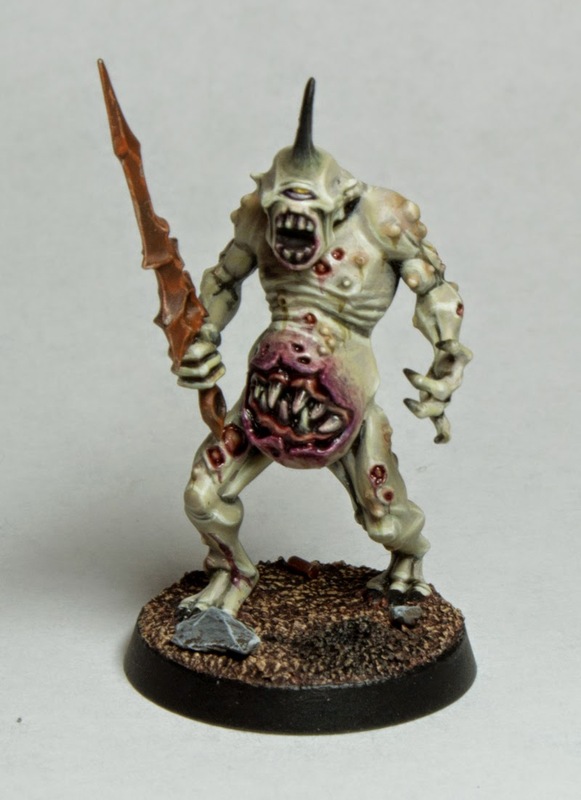 I really like the pallidness of their skin as opposed to the standard green skin you usually see. 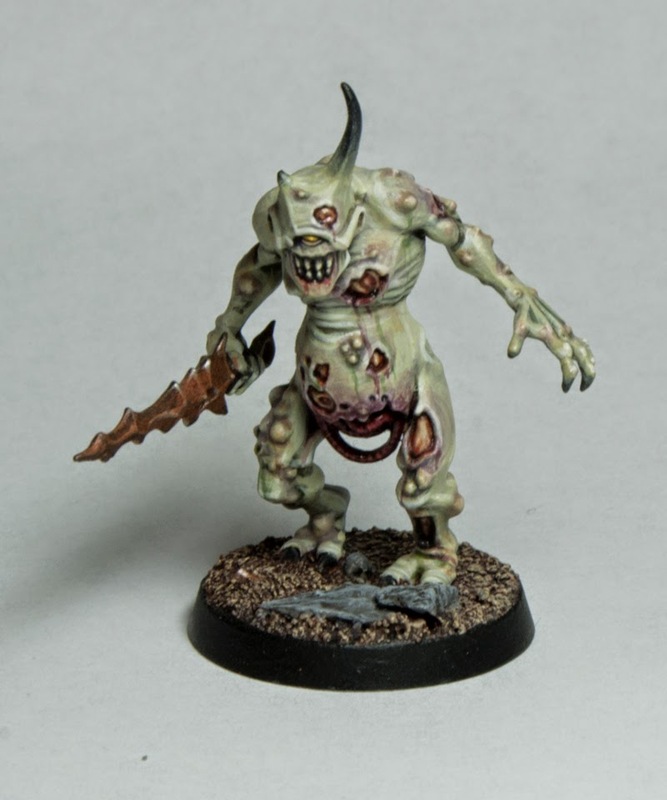 Don't get me wrong, I like the green tones too but this putrid white just lets you show off all the sores and bruises more. The second most time consuming part after the skin are the claws and horns since they fade to black. It's a lot of going back and forth with my colors until I got a smooth transition and I always had to look at an older model to make sure the gradient was the same. 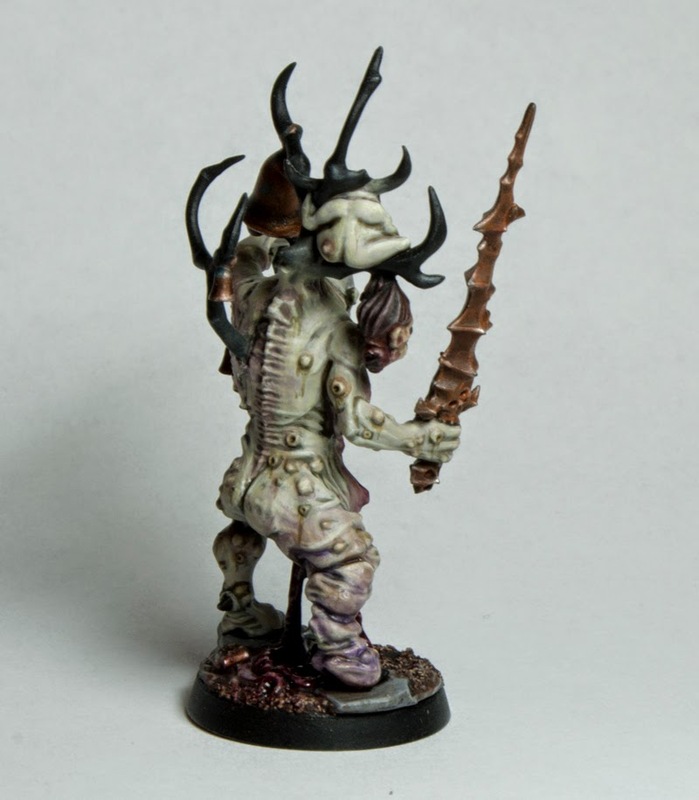 Once I had finished 6 of them I decided that the 7th model would be the new plastic Herald model to lead them. This guy is just pure awesome, everything about him, except for his head. The stock model's head reminds me of the creature from the black lagoon or something like that. 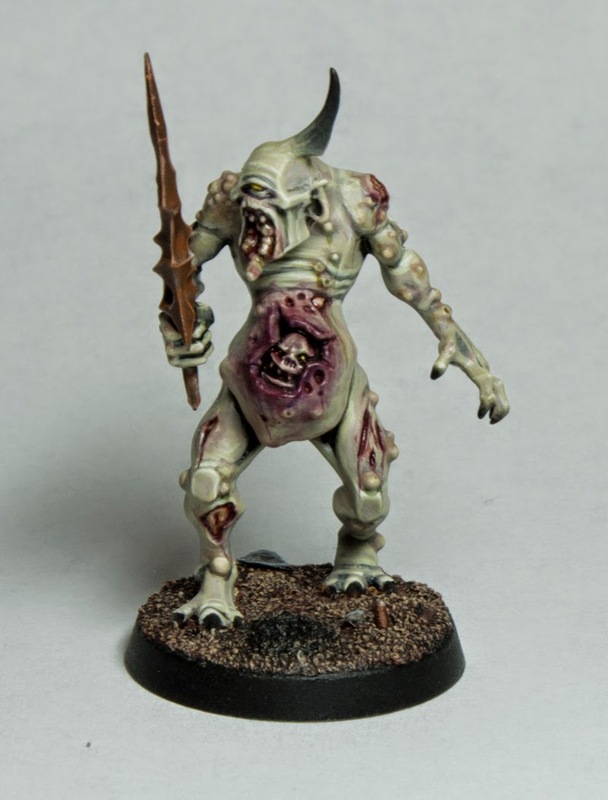 It did not fit the Plaguebearer aesthetic at all to me so I did a simple head swap. I picked a head from the regular squad and blended the join with greenstuff. I think it suits the model and the smaller head really emphasizes how large this guy is. I still have 4 more models to paint for this squad for them to even be game legal, but they have gotten a few games in, I just sub in 4 of my older metal guys to round out the numbers. 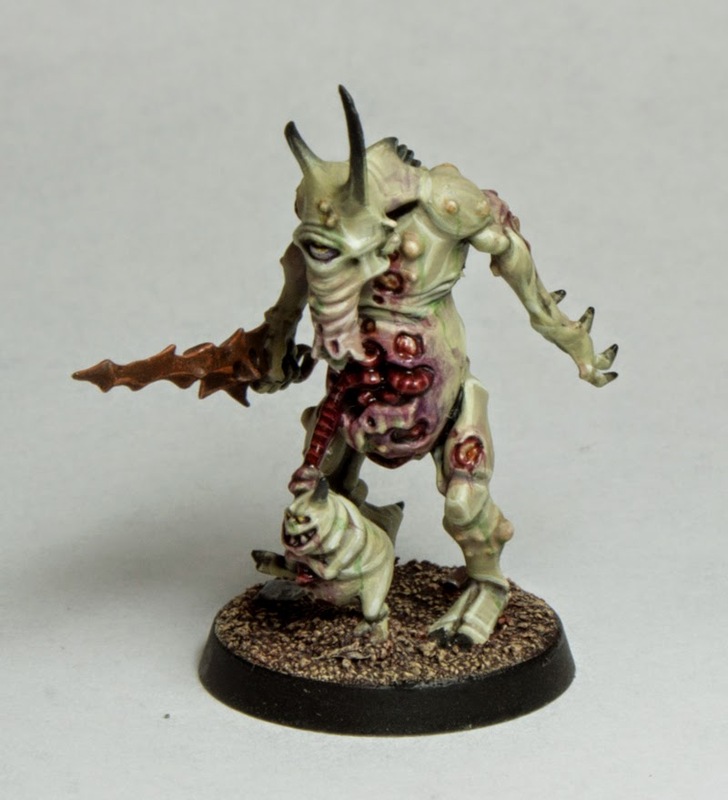 I also have 3 of the new Nurgling bases and I would really like to try painting some of the new Plague Drones at some point. 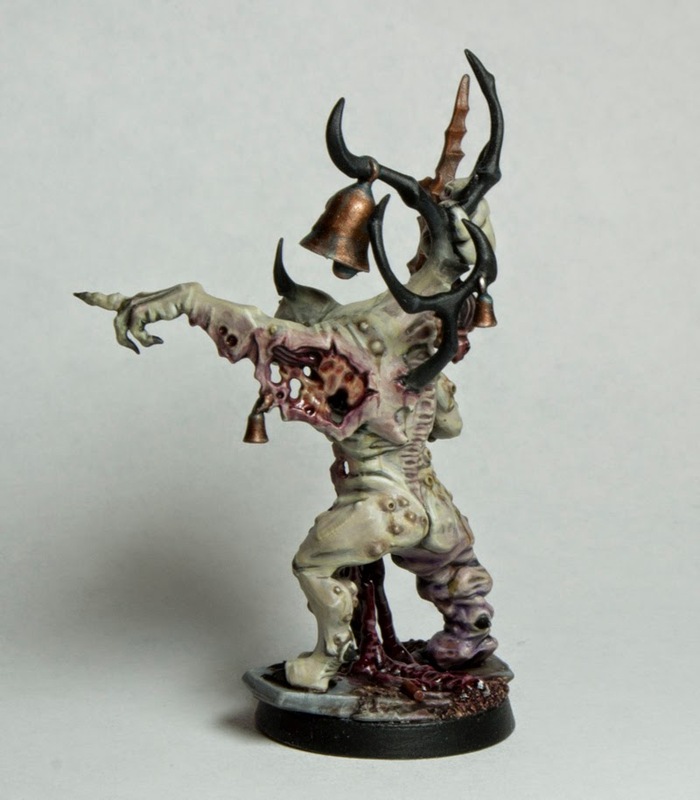 I plan on painting more in this scheme but its all about finding the time to fit them in. Don't worry though, the next one I paint will get documented to make a step by step painting guide. Be sure to vote for the Herald on Cool Mini or Not here, and the whole squad here. The Vault: My Very First White Dwarf!